Our friend Steve Bourie at American Casino Guide, has a great new video interview with Michael "Wizard of Odds" Shackleford about blackjack. Mike answers some of the most common questions that players have about the game, plus he gives tips on how players can choose the best games, use the proper strategies and also take advantage of the casino comping system. The video can be accessed directly from this link: http://www.youtube.com/watch?v=YkUsN-GNCSY. Congratulations to Frank Kneeland on his new radio show, which he co-hosts with Bob Dancer. "Gambling With an Edge" airs at 7 pm (PST), Thursday nights, on KLAV Talk-Radio 1230am, or listen streaming at http://www.klav1230am.com. You can also listen to archived shows at: https://www.progressivevp.com/radio_show.php. E-mail subscribers can also read each month's issue online at our web site: BJI Issue #133, February 2011. The complete Speed Count system is included with the base application. Or, purchase the complete High-Low count system and others as In-App purchase right inside the software (Add-ons mode), installed immediately into the program. 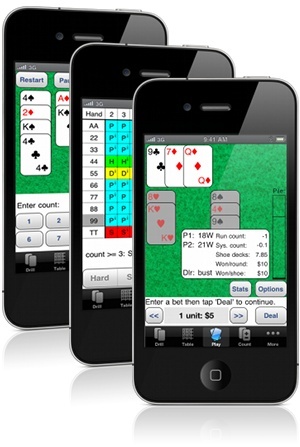 Now their great blackjack basic strategy trainer is available for iPhone and iPod touch. Includes new automatic action table selection from 144 built-in tables for different blackjack rules (including surrender and ENHC). 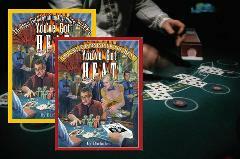 The 2011 Blackjack Ball was recently held at a secret location in Las Vegas. Joe Pane attended and he summarizes what went down at this gathering of blackjack pros from around the world, including sharing with you the infamous Blackjack Ball Test taken by the pros..."
"If you (and your team) are planning a three-day weekend to relieve casinos of some of their cash, heed these tips to avoid detection..."
"The typical first reaction for most players when they lose is to retreat into a bad mood and wallow in misperceptions. That quickly leads to going off strategy. Sometimes even seasoned professionals take this dangerous path. Surrendering to a tilt episode is a quick way to vaporize a bankroll. It's the gambling equivalent of death. Therefore, here are five tactics to help you avoid that catastrophe..."
"I sat at a $25.00 minimum table to get the feel of the pit-personnel. M.R. secluded himself by the slot machines so he could see my signal to enter the game at a positive count. It was in the middle of the third shoe that the count was positive and it looked like it was going to remain there for a few hands. I signaled M.R. to enter the game, and he sat down and bet $500 on two hands each..."
"Read answers to reader's questions on blackjack, covering tipping, five vs. seven-spot tables, and betting more on a double down..."
"Blackjack players everywhere should come to the defense of player-friendly rules that presently make Pennsylvania's blackjack game so appealing. The requirements that naturals be paid at 3-to-2, that the dealer stand on soft 17, and that casinos offer late surrender, could be at risk in coming weeks. Now is the time to speak out..."
"This is our first full day in Tunica. I started playing at the Gold Strike, with an early morning session, at a $5 denomination, six-deck game. There were only three tables open. It turned out to be one of those frustrating sessions, where the dealer never seemed to break and kept hitting into three-, four-, and five-card 20s and 21s..."
"Card counters and dice controllers: Are they happy? Can counting cards or playing with an advantage at craps detract from the happiness of playing casino games..."
"This month I decided to preempt my BJI series of articles on progressive video poker to present, instead, the article you are about to read. (We'll get back to our regularly scheduled program next month.) The article is certainly intended for VP players, but it also useful to a slightly larger demographic; namely, anyone still sucking air..."
"In Texas Holdem you are not trying to win a lot of pots, you're trying to win the most money. In fact, the player who wins the most pots will usually be a losing player because they are playing too many hands. Two ways you can increase the money you win is with the slowplaying and check-raising. Both of these tactics have sometimes been referred to as "sandbagging" (especially in home games) but there is nothing underhanded about either tactic. This month I'll offer you tips on how to be successful slow playing your hand..."
"Check out the schedule of major blackjack tournaments in February and Marchby region in our Blackjack Tournament Report courtesy of blackjacktournaments.com..."